Former Bafana Bafana coach Clive ‘The Dog’ Barker has released a biography, Coach: The Life and Soccer Times of Clive Barker. The book is an in-depth look at South Africa’s most successful and longest running national coach, who led the team to their only Africa Cup of Nations success in 1996. 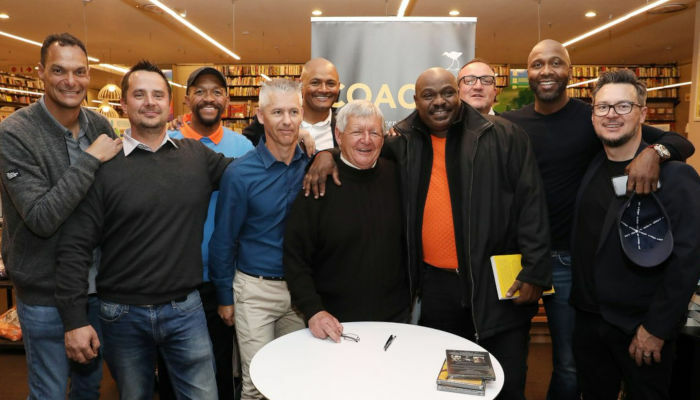 The book was launched at Exclusive Books Rosebank Mall on 12 July, with Class of ’96 stars Andre Arendse, Mark Williams, Shaun Bartlett, Linda Buthelezi, Lucas Radebe and Mark Fish all there to share the moment. Clive Barker, legendary South African soccer coach, shares career highlights. Barker will be in Durban to launch the book in his hometown this Thursday, 19 July, at Exclusive Books Gateway. Barker joined John Perlman in the Kaya FM studio recently to chat about the glory of the 1996 Afcon, his biggest regrets and how he worked with the likes of superstars Lucas Radebe and Doctor Khumalo.